Watford vs Arsenal predictions and betting tips for the Premier League fixture on Monday 15th April. After the highs of reaching the FA Cup final, Watford are looking to take advantage of poor travellers Arsenal who are right in the race for a top four finish. Watford will be looking to strengthen their bid to finish 7th after Wolves and Everton lost this weekend. Arsenal hoping for their first away clean sheet of the season. How will Watford react after winning the dramatic FA cup semi-final last weekend? Watford have been having an incredible season so far. Javi Gracia has turned them into a real force this season and has lead them to a position in which if they finish 7th, they will qualify for next season’s Europa league. Which for Watford FC would be absolutely huge. They come into this game on the back of one of the most dramatic FA Cup semi-finals of all time, beating Wolves 3-2 after extra time. Arsenal really are the most inconsistent side in the Premier League. They play like Barcelona at home and play like Aldershot Town away from home (no disrespect to Aldershot). Unai Emery must be a very frustrated man when his side fail to pick up points consistently away from home, as they could easily be sitting comfortably in the top four, potentially putting pressure on the top two. Their troubles seem to be coming through their poor defence, as they find themselves the only side without an away clean sheet in the league. With all that in mind, the match prediction for this Watford vs Arsenal game is for the teams to share the points. The draw is best price 14/5 with Unibet who give their new customers £40 in free bets. Who will win? Watford or Arsenal? With the cup final being nearly a month away, Watford can really go all out in the Premier League again after taking their foot off the pedal in the last few weeks. This game will definitely have goals; not surprisingly with the amount of attacking talent available on both sides. It is always rather difficult to predict who will be starting up top for Arsenal, however for Watford it is almost a given that captain Troy Deeney will play. With Arsenal’s poor away defensive record, my Watford vs Arsenal tip is for Troy Deeney to score any time. You can get that at 21/10 with Paddy Power as well as their £20 risk free sign-up offer. Arsenal are the third highest scorers this season after Liverpool and Manchester City. Even though they didn’t manage to score in their last game against Everton, I feel they will fancy themselves to score in this game. Another recommended betting tip for this game is both teams to score, but the odds are too short unless you’re adding it to a both teams to score acca. This is a very difficult fixture to call. Watford have been great this season, as well as their opponents Arsenal. 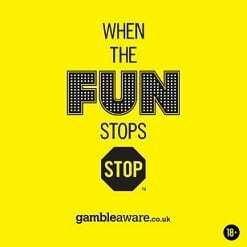 Watford may have a potential ‘hangover’ from the ecstasy of last weekend which may leave them complacent, or they may use the confidence to push on and win this game. Arsenal will definitely be looking to redeem themselves from last Sunday and us the confidence from beating Napoli in the week. I cannot choose between the two sides, however I do feel that there will be many goals. I am therefore tipping a 2-2 draw which you can get at 11/1 with William Hill – bet £10 on this match and get THREE free £10 bets for the Champions League when you open a new William Hill account. 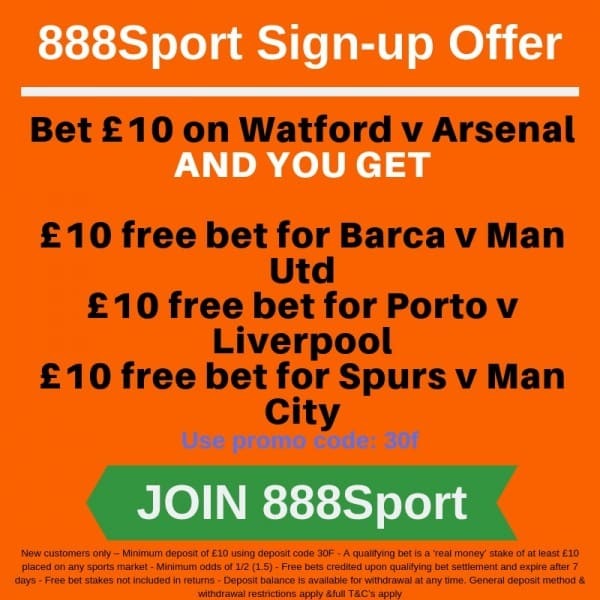 Open a new 888Sport account and bet £10 on this Watford v Arsenal fixture > win or lose you will get THREE free £10 bets credited to your new account. CLAIM HERE – 3 free £10 Champions League bets @ 888Sport.